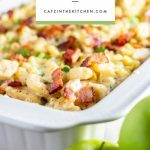 Sweet & savory, with salty bacon, tart apples, & sharp cheesy goodness - Apple Bacon Mac and Cheese is the easy comfort food recipe you've been looking for! Pre-heat oven to 350 degrees. In a large skillet, cook the bacon over medium heat, stirring frequently, until crisp, about 8 minutes. Using a slotted spoon, transfer to a paper-towel-lined plate. Pour off all but 1 Tablespoon fat, add the apples and cook stirring frequently, until browned and beginning to soften, about 5 minutes. Transfer to a bowl. In a pot of boiling, salted water, cook the pasta until al dente. Drain the pasta. In a medium saucepan, melt the butter over medium heat. Add the flour and cook, whisking constantly, for 1 minute. Whisk in the milk; cook until smooth and thickened, about 10 minutes. Remove from the heat and add 1 1/2 cups cheese and a generous sprinkling of pepper; whisk until smooth. In a bowl, add the pasta, sauce, apples, and parsley; toss well. Reserve 1/4 cup of the bacon. Add the remaining bacon to the pasta, toss. Season with salt and pepper. Pour the pasta into a 9×13 baking dish. Top with the remaining 1/2 cup of cheese and bake for 30 minutes. Sprinkle with reserved bacon and serve hot.